By James W. Russell (Beacon Press, Boston, $26.95). You have a 401(k) plan at work that you’re using to save for retirement. Forget it. You’re on a Fool’s Errand. Don’t even try to use it. There’s no hope for you to fund your retirement plan. That is unless you can magically turn back the clock and transform it into a traditional pension plan, also known as a defined benefit plan. Such is the frightening message of this lively, but often silly book. The author is a Fulbright professor who is identified as “an authority on retirement systems policy.” (Except he did a very bad job with his own retirement investments. More on that anon). He details how he successfully led a workplace movement to replace his egregious 401(k) plan with a traditional pension plan. First, let me stipulate that I partly agree with the author that the defined contribution/401(k) retirement plan certainly has some faults: It can be too expensive and not have enough good investment choices. But, the biggest issue is people often misunderstand how to use these retirement accounts (I once knew a financial writer who broke into her 401(k) to buy a car, which wrecked the compounding effect of her savings plan). But people also often misunderstand stocks, their credit cards, mortgages and other financial tools. Is that a reason to trash them? (No, that is a reason to understand them before anything else!). Still, the (401)k can, under the right circumstances, be successfully used as a primary or secondary retirement saving tools. And, by the way, the alternatives to the 401(k) aren’t all beer and skittles. What’s So Great about Social Security? All retirement plans, most especially Social Security, have limitations. The author thinks Social Security is a wonderful system (Social Security is slated to pay me a measly $20,000 a year or so when I turn 70 in the year 2,022. That’s not much of an income today. Imagine what that amount will be seven years from now even with low rates of inflation. Thank God I won’t be depending on Social Security! By the way, the author uses the same title, “Social Insecurity” as a famous book by a former Social Security Commissioner, Dorcas Hardy, who famously criticized the program. Professor Russell never mentions that book or Ms. Hardy). They needed to accumulate private sources of incomes, such as a 401(k) plan or an IRA or a pension. But, fortunately or unfortunately, few employers are offering pensions, nor will they anytime soon. Still, the biggest fault of 401(k) defined contribution plans is that some people don’t understand them. So they end up not contributing enough or not properly diversifying investments. Some employers, those not doing very well, can’t afford the best 401(k) plans. And, owing to limited profitability, that would probably be the same if we were back in the era of the pension plan. Good benefits are always a function of how well a company is doing. But the lack of understanding can be a problem of all investments inside or outside of qualified retirement plans such as 401(k)s. There can also be problems with mutual funds or stocks or bonds or managing your daily cash flow. If you don’t know what you’re doing, you are unlikely to do well in anything to do with money, or in any other endeavor. Learn or suffer might be the credo of this Information Age. We all must adjust, one way or another. However, if one accepts the thesis of this book—401(k) plans are fatally flawed and so if you have one in the workplace may the Lord have mercy on you—-then you might as well give up. There is no chance for you ever to achieve financial independence. This opinion of the author apparently stems from his own 401(k) experience. Professor Russell obtained a poor return on his retirement contributions over a thirty year period. He invested some $254,000 and only ended up with some $532,000, a paltry return of some four percent a year. The author warns anyone using his or her 401(k) to save for retirement should remember this: “My experience gives a rough idea of what to expect.” (p169). That’s not what I, and many others I know who took a little time to monitor their retirement investments, received. We didn’t get Buffett-like annual returns of 20 percent, but we certainly did a lot better than four percent. Indeed, I rose from the book wondering how the author, an academic presumably with some knowledge of economics and investing, could have ended up with so little. Did he forget to properly diversify? How could this have happened to “an expert in retirement systems” and in a time that was generally very good for the stock market. This was the same 30-year period—from the mid 1980s to about 2015—when the stock market was racking up some of its greatest years. Sure, 2001 and 2008 were messes. But most of the 1990s were great. And 2009 was a wonderful year as have many succeeding years. Yes, the first decade of this century was lousy but the last five years have been very good. Profits will go to the patient investor, who continues to invest in bad times and good. So, if one kept investing over long periods, one would have done very well. One would have had the chance to reach the historic long range return of the stock market, which is about nine percent, which is some 125 percent better than what Professor Russell obtained. Let’s examine an average long term investor. If one just invested about $8,000 a year, about the same as the author, and received nine percent a year—the historic long term rate of return of the stock market—then, after thirty years, one would have about $1.35 million or about 150% more than the author’s some $532,000. The author apparently believes his poor returns were the fault of the 401(k) vehicle. Maybe they were the fault of his poor investment selection. In any event, he managed to obtain lousy returns in a period when stocks were booming. The system, the author says, is rigged against us. And, more importantly, you are not smart enough to do it yourself without some higher entity—an employer offering a voluntary pension plan or a government forcibly taking the money from you each pay period and putting it into a government plan, such as Social Security, which dishonestly took the profits from the “trust fund” over decades and spent it on anything else the government wanted to spend it on—-telling you what to do. To which I respond: Learn a little, professor! And, by the way, speak for yourself. I know plenty of people who want to take an interest in where and how their money is invested, whether in or outside of retirement plans. However, the author seems to be saying, even though the investments in our 401(k) belong to us, and even though there is the potential to accumulate substantial assets over time, we can’t be expected to know anything about our financial assets. No one needs to become an “expert” investor to do decently with his or her retirement savings. If one consistently invests over the long period, takes advantage of every employer match, uses low-cost index funds and diversifies—uses stocks, bonds and maybe a little bit of an alternative asset—-most people can accumulate a nice stash over the long run. They can certainly do better than four percent if each of us learns a little of the investment basics. And yet here is another point where I disagree with the author, whose 401(k) investments performed poorly. Yet I believe, with some basic financial education—stay with GregoryBresiger.com—-and the luck of having an employer who has a good 401(k) good plan—one with lots of good choices and a generous match—the average person, with patience and discipline, can do well. So how about just educating people in high school about the basics of money management? Sorry, that won’t work, Professor Russell tells us. This is my biggest gripe with the author: He can’t see the biggest issue with a defined contribution plan is the biggest issue with all investing: A lack of investor understanding. That leads people either not to invest or to make wildly inappropriate investments along with ridiculous expectations (I knew people in the 1990s who were getting 20 percent a year on their investments who thought they were getting ripped off!). Remedy the education issue and many of the problems that the author writes about would dramatically decrease. But here is the problem. After all the author’s travails he has experienced, the author actually opposes investor education. He sees this as a part of a Wall Street plot to get more business. What does the author advise? Pressure employers to restore pension plans and trust in Social Security. 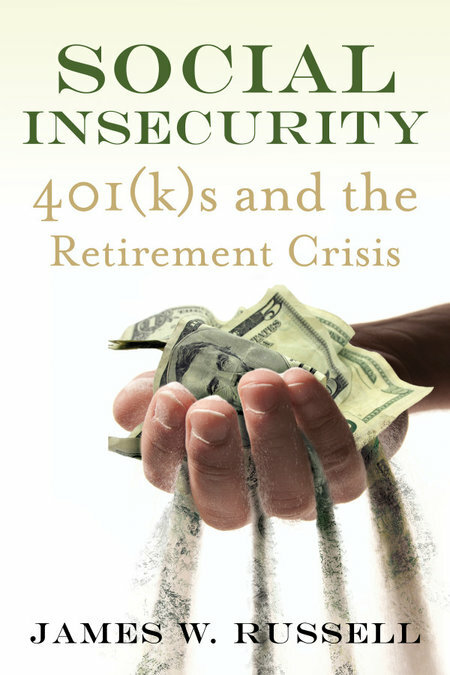 Of course, if the author is upset with what he received out of his 401(k) plan, then he should be fuming about our government retirement income program, Social Security, which provides pathetically small payments and is now running in the red after many tax increases. Can We All Go Home Again? How about the author’s call for the employers all going back to the pension plan? That is about as likely as the Dodgers returning to Brooklyn or people all chucking their cell phones for land lines. Most companies, in part owing to tax breaks and the overall low costs of defined contributions versus defined benefit plans, are not returning to pension plans anytime soon. Sorry, like it or not, that’s just a fact. So we all are just going to have to get used to 401(k)s, cellphones and learning some investment basics for the foreseeable future. And it is good to learn something about a retirement savings vehicle, that properly used, can help millions of people achieve retirement savings goals. *Learn all you can about investing. Of course, analyze everything you read and consider the source. *If you have a good 401(k) plan at work—with generous employer matches—-take full advantage of it. *Opt for the lowest cost index funds in your retirement plan, inside or outside of work. *Diversify. Be sure you have stocks as well as bonds. Try to diversify within each investment category (Large cap and small cap stock funds as well as long term and short term bonds). *Invest for the long term in your retirement plans as well as your investments outside of retirement funds. *Put money in each pay period or month. Stick to your investing discipline, especially in bad times when you can buy shares at a cheaper price. *Realize victory in the investing game—achieving financial independence—is a marathon, not a sixty yard dash. Do it as long as you can. If you can do 25 instead of 20 years, do it. If you can do 30 years, instead of 25 years, do it. Compounding is one of the great weapons in anyone achieving an investment goal. With apologies to the author, all is not hopeless, although there are some 401(k)s that are so-so (the employer doesn’t contribute or has mediocre investment selections). So be sure, if you can, to set up your own retirement options such as an IRA plan. And use index funds. Don’t pay attention to the people like the author. You can do it.